Adding images in JLabel, Using HTML tags. 3 Responses to Adding images in JLabel, Using HTML tags. the pgm is nt running in my system. there is prblm wid the image linkin only can u help me for dat. For the given example, i have images/emoticons/01.png url in the same location where the class file exist. 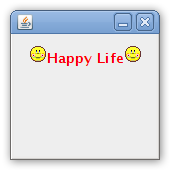 So there is images directory and emoticons inside images and 01.png inside emoticons directory. I think you might had mistaken to for URL. if not, plz send me just that label code. Hi, I am trying create and html with java. I already have the actionlistener so that the image can be created on my container but now can you help me how to save the image show it on an html?